JOIN US AT THIS YEAR'S DIA DE LOS MUERTOS (DAY OF THE DEAD) CELEBRATION! A FUN TIME FOR THE WHOLE FAMILY! 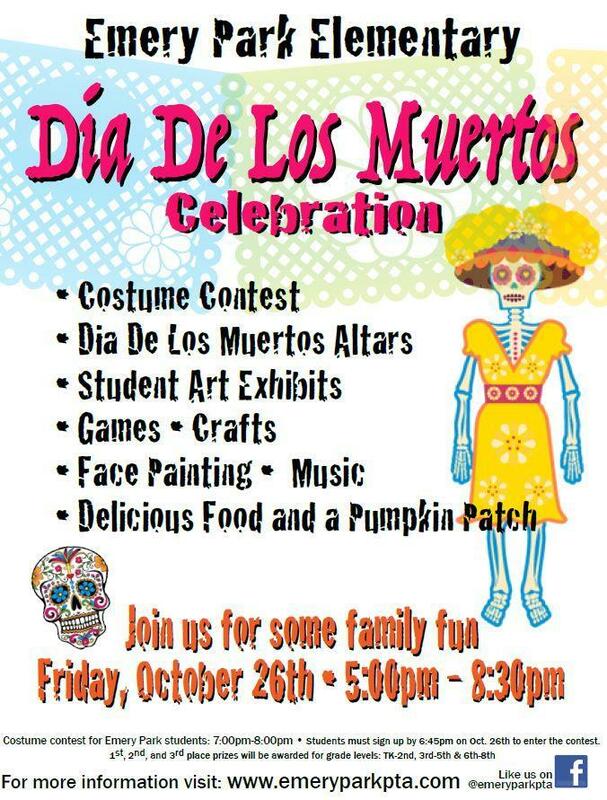 Emery Park's tradition of a Dia de los Muertos Celebration will be on Friday, October 26th, from 5:00-8:30 pm. There will be traditional altares, a student art exhibit, games, crafts, face painting, music, food, a pumpkin patch and a costume contest! We hope to see you here! It is sure to be a lot of fun for the whole community!